After months of planning, research, writing, and design, your new B2B research report is set to launch. An eBook: All of the brilliant (and statistically valid) research and insights you’ve gathered have been neatly packaged into a downloadable eBook. An infographic: The design team has taken the most tweet-worthy stats and created a tantalizing infographic to accompany the eBook and drive social shares. The landing page: Your dedicated landing page is live, complete with a contact form that’s been integrated with your customer relationship management (CRM) system. There’s even an A/B test set up to monitor conversion rates using varying headlines and images. A blog post: Your team has written an engaging blog post, featuring key takeaways and a call-to-action (CTA) to download your eBook. SlideShare: The infographic and an eBook teaser have both been uploaded to SlideShare to maximize reach and sharing potential. Social media: Social updates have been scheduled from your company’s accounts on LinkedIn, Facebook, Google+, and Twitter. Website CTAs: Banner and tile CTAs have been added to popular pages throughout your company website to convert visitors to leads. Lead scoring: Marketing has collaborated with sales to determine criteria that define sales qualified leads (SQLs), and lead scoring has been set up in your marketing automation system. Lead nurturing emails: An automated email workflow has been created and scheduled to nurture contacts that download the eBook. An associated webinar: A webinar featuring insights from the research has been planned for the purpose of capturing the leads that are further along in their buyer’s journeys. The CTA to register for the webinar has been featured in your series of lead nurturing emails. Webinar emails: Another lead nurturing email workflow has been configured to follow up with those who have already downloaded your eBook AND attended your webinar. Internal team alignment: An email has been sent to your sales team members detailing the content marketing campaign and offering tips on how they can integrate the new content asset into their sales activities. Campaign tracking: All URLs that will be shared have been tagged using Google’s URL builder tool, in order to monitor traffic and conversion sources. Seems pretty thorough. Right? But there’s more you can do to help your content marketing plan surpass your expectations for success. Let’s explore how public relations can add fuel to this content fire. Unfortunately, PR has gotten a bad rap at times because professionals have historically relied on “soft” metrics such as placements, impressions, and ad equivalency to create the perception of value. They have failed to connect actions to outcomes, and clearly demonstrate how PR activities impact key performance indicators (KPIs) that are relevant to the C-suite. But, times are changing, and modern PR pros are becoming adept at building strategies that have an undeniable impact on expanding reach, driving website traffic, generating leads, increasing sales conversions, and enhancing customer loyalty. 1. Build a media database: Start with a media database that includes business publications, blogs, and trade publications in relevant vertical markets. At minimum, the information you track should include: outlet name, organization, phone, email, social profile links, areas of interest/beat, and notes. Ideally these contacts will be uploaded and managed in your marketing team’s CRM system. Tip: Journalists and bloggers are in the business of telling stories that matter to their readers. If your content isn’t relevant to their audiences, don’t waste their time (or yours) blasting out pitches and press releases to them. 2. Pull editorial calendar information: Traditional print publications often publish editorial calendars that show the topics they plan to cover throughout the year. Research the calendars of your target media outlets, and look for topics that align with the content in your campaigns. 3. Pitch story ideas to relevant media contacts: Once your media database and editorial calendar list are complete, seek opportunities for customized pitches. 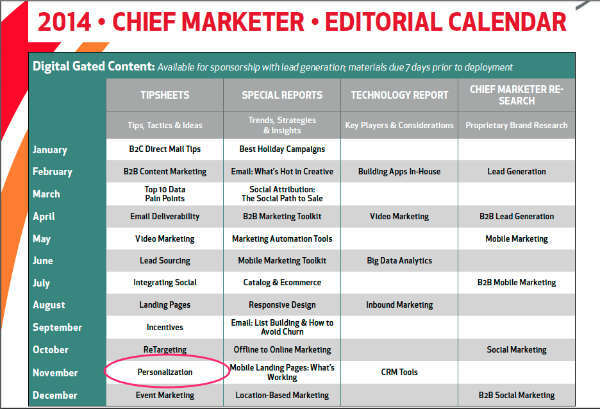 For example, if you know Chief Marketer Magazine plans to write about Personalization in its November issue (PDF: sample editorial calendar), you might consider pitching your eBook, 10 Ways to Personalize the Customer Journey, to its editors. 4. Identify bylined article and guest post opportunities: Publications and blogs often accept contributions from outside writers. Bylined articles and guest blog posts from your executives and marketers are a great way to expand reach, build quality inbound links, and drive referring visits to your website. 5. Conduct influencer outreach: Does your eBook feature insight from industry influencers? Is the content highly relevant to influential bloggers? If so, take a strategic approach to get the information in front of them — and (hopefully) their audiences. 6. Consider partnerships: Evaluate the associations and organizations in your network that have expansive reach. Consider ways to collaborate and distribute your content through their events, emails, and websites. 7. Pursue speaking engagements: Identify opportunities for your company’s leaders to speak at industry events. This will give you a platform to discuss relevant topics and concepts from your content marketing with members of your target audience, as well as a way to use your content to showcase your company’s credibility, thought leadership, and expertise. 8. Submit your content for industry awards: Look for programs, such as the Content Marketing Awards, that recognize excellence in marketing. Award programs are a great way to extend the life of a content marketing program, and extend your reach to new audiences. Are you using PR strategies to amplify your successful content marketing campaigns? Share your stories, and tips, below. 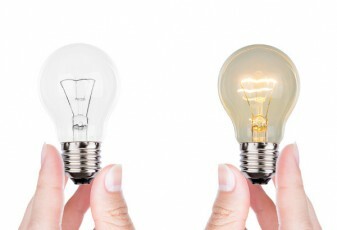 Need help finding which content marketing tactics will put your business on the path to success? Check out CMI’s guide to Building the Perfect Content Marketing Mix: Execution Tactics.